Make sure the "greens" or "whole foods" powder or pill you use passed our tests and is right for you! Which are the best "greens" and "whole food" supplements? These powders, drinks, and pills are made from an array of ingredients, such as wheat grass, alfalfa, kelp, spirulina, chlorella, leafy vegetables and other chlorophyll-containing ingredients, as well as fruits. To evaluate their quality, our testing focused on how free they were from impurities -- heavy metals, microbes, and dangerous pesticides, and that gluten-free products were really gluten-free. The good news: We did not find microbial or pesticide contamination in the products. The bad news: One product was contaminated with a toxic heavy metal— a problem we've seen several times before with these types of products. We also found that a "gluten-free" product had a considerable amount of gluten, although just below the FDA limit, which may be of concern to people who are particularly sensitive to gluten. Across the powders and capsules, the cost to get an equivalent amount of greens/foods powder ranged from 37 cents to $3.02. Our Top Picks fell in the middle range. 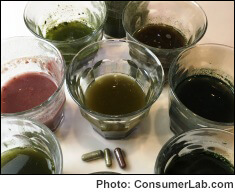 You must be a member to get the full test results and reviews for "greens" and "whole food" powders, pills, and drinks along with ConsumerLab.com's recommendations and quality ratings. You will get results for 13 products: 10 selected by ConsumerLab and three others that passed voluntary certification testing. Concerns and cautions with greens and whole food products, including specific concerns with chlorella, spirulina, and Aph. flos-aquae.